A super looking, extra tall, tongue and groove corner summerhouse with a bright and airy contemporary feel, the BillyOh Picton will bring a new dimension to that corner of your garden you've been looking to fill. 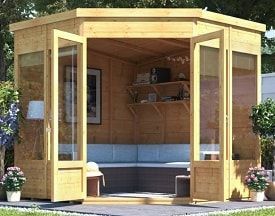 The summerhouse is constructed in quality materials by an established manufacturer and its traditional pentagonal corner design with its clean lines and modern window and door construction is ideal for today's garden. The Picton is constructed in pre formed 11mm graded European softwood tongue and groove panels. The large windows are finished in an up to date design glazed in 1.8mm styrene to allow panoramic views of the garden and to ensure a light and bright interior. The floor and roof are also constructed in pre assembled 11mm tongue and groove panels, the floor mounted on 28 x 28mm bearers for rigidity and strength. The roof can be finished in optional sand or green mineral felt for a professional watertight finish. The height of the Picton at the eaves is 5' 9'' (1.76m) rising to 6' 10'' (2.09m) at the highest point. The double door opening 3' 10'' x 5' 8'' (117.2 x 172 cm). A base finish is applied to the Picton to maintain the timber between manufacture and delivery. It will be necessary to apply a final preservative/decorative finish at the time of construction and to maintain this on a regular basis throughout the life of the summerhouse. Options available for the Picton include shelving, coloured timber treatments, padlock options and an assembly kit. The summerhouse is delivered flat packed in easily handled sections for diy assembly by the purchaser. The BillyOh Picton, introduced in 2017 as a replacement for BillyOh's old 5000 Georgian design is certainly an attractive looking corner summerhouse in a modern style. Its compact 7x7 corner design means it's ideally suited for the corner of a smaller garden where it should look right at home. Although it's footprint is compact there's a decent amount of headroom with the headline clearance of 6'10''. This does include the floor and floor bearers though. The real world maximum internal height is more like 6'6'' - still more than enough for us! As far as the Picton's structure is concerned, the 11mm cladding is in line with what you'd expect from a budget model and once everthing's assembled it should all come together in a strong, rigid building. In particular, we like the tongue and groove wooden floor and roof which is an improvement on the OSB sheet you often find on cheaper models. Be aware though that 11mm is the minimum cladding specification you'd expect to find on a summerhouse and it is more prone to splits and knot holes than some of the thicker finishes you find on more expensive models. We don't really see this as a problem, the important thing is the tongue and groove construction, but you may find that you have a little filling to do or a few rough edges to smooth off before final decoration and use. On which subject, note that in line with the most summerhouses in this price range the Picton is treated only with a base coat prior to delivery. This will be sufficient to protect the timbers until the summerhouse reaches your doorstep but you will have to apply a further preservative/decorative finish at the time of assembly. We favour adding the finish before putting the summerhouse together as that way you won't miss any hard to reach areas and the various openings and joints should be properly treated. You'll find the Picton available with a selection of optional finishes which can be ordered along with the summerhouse. Note that these are for diy application and the panels won't be delivered ready finished. The Picton's large fixed windows are bang up to date as far as style is concerned and the virtually unbreakable 1.8mm styrene glazing is to be preferred to standard glass - even if it is more prone to scuffs and scratches. Of course, toughened glass would be the ideal glazing medium but it would be unrealistic to expect this in a summerhouse in the Picton's price range. The windows are fixed which is a bonus for security but means they can't be opened for ventilation on a hot sunny day. You can deal with ventilation by opening one of the double doors though. Overall we'd expect the Picton to display good wind and watertight properties by virtue of the tongue and groove construction. Although offered as an optional extra, it is essential to apply either the sand or green mineral felt roof covering to ensure proper resistance to the elements and you should bear this in mind when ordering. Assembly of the Picton looks straightforward enough. It's delivered in pre assembled wall, floor and roof panels and these should all fit together without any great difficulty or drama for anyone with a basic knowledge of diy. Just don't forget to apply a decorative/preservative finish at the time. An untreated timber building will very quickly take on a worn and weathered appearance once erected and exposed to the elements, not to mention its susceptibility to attack by rot and pests. In all, as a corner summerhouse slightly higher up the economy model scale, the Picton shouldn't let you down. If you're attracted to the large windows you might also have a look at the Premieir version of the Standard and Premier 7x7, Barclay 7x7 and the Cranbourne (though the Barclay does have an OSB roof and the Cranbourne an OSB roof and floor. You can usually find these summerhouses available a little cheaper that the Picton and depending on your tase and priorities they may offer a better option. We'd recommend also checking out the Blockley, Oxhill and Bancroft. They tend to be closer to the Picton on price and offer similar dimensions with an apex roof. We've given the Picton 4 stars to reflect its usual selling price and the wooden floor and roof as a feature of the otherwise budget construction. If you own a BillyOh Picton Corner Summerhouse we'd be delighted if you'd submit a review to help other prospective customers. You can do this on our Corner Summerhouse Review Form - we look forward to hearing from you.